Boxed, Hardcover, 9.5 x 13.5 in. / 224 pgs / 200 color. 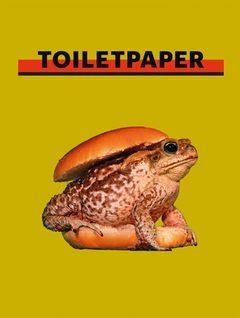 In a hotly anticipated follow-up to the first Toiletpaper anthology, Toiletpaper Volume II: Platinum Collection presents a selection of the best images from the past five issues of Toiletpaper magazine, the creative collaboration of Maurizio Cattelan and Pierpaolo Ferrari. The book also includes special projects shot by Cattelan and Ferrari for such publications as Purple, New York Magazine, Kenzine, Le Monde and Dazed & Confused. Along with the outrageous and inventive images, Toiletpaper Volume II contains an eclectic collection of texts, ranging from Nikolai Gogol’s The Nose to an excerpt of a California law regarding frog jumping to a list of inventors killed by their own inventions. 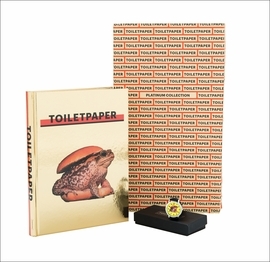 This is a limited edition publication of 1,000 copies, each of which is accompanied by a watch created by the Toiletpaper team. Imagery is the lifeblood of the Toiletpaper aesthetic, always bright, often scatological or willfully perverse; the Platinum Collection doesn't disappoint... Just 1,000 copies are available, each with its own toad-printed 'Toiletpaper watch', a new way of living a very unconventional brand. Text by Alan Judd, David Crane. 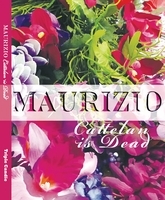 Edited by Cecilia Alemani, Maurizio Cattelan, Massimiliano Gioni, Ali Subotnick. FORMAT: Boxed, Hbk, 9.5 x 13.5 in. / 224 pgs / 200 color.